Read CC v Earby CC in the second round of the Ramsbottom Cup. Read batsman Joe Marshall. Picture by Paul Heyes, Saturday May 09, 2015. 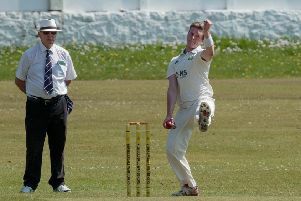 Read ran out winners over Cherry Tree at Preston Old Road, though fifth spot remains the best finish they can hope for in Section A of the Ribblesdale Cricket League this season. There’ll be no involvement in the LCB Knockout Cup competition for Joe Marshall’s side next term, but they’ll be hoping for a strong finish. Marshall, the second most prolific amateur batsman in the league with 536 runs, shone for the visitors as he hit 10 boundaries on his way to a knock of 56 as Read finished 201-9. The hosts failed spectacularly in their chase, falling 105 runs short as Andrew Rushton and Frank Barden ripped through their batting line-up. Rushton took 5-26 while Barden added 4-15. Read are at Euxton on Saturday.